Elliebelly Knit & Dye Works > Blog > Knitting Update: Works in Progress > A New Start & A Near Finish. And Something in Between. A New Start & A Near Finish. And Something in Between. A new start. The Forest Park Cowl in The Plucky Knitter's Primo Aran in Heirloom Green. With all of its bonny cables, this pattern feels like it fell right off the pages of Outlander. I've started this as an easy project to carry around, but plan on finishing a few in-the-works projects before I get serious about it. An "almost there." Frostline is all done and just awaiting its lace edging. And I'm in love! Vodka Lemonade. Will it ever end? Just kidding Vodka Lemonade. I really do love you. The 7" of seed stitch in the collar on all 300+ stitches was sort of a bummer. And then keeping the various columns of seed stitch and ribbing straight, along with the right side increases, as I worked from the top of the shoulders shoulders down to the point where the sleeve stitches can go on a holder and the body be worked alone was a bit of a challenge for me. But I'm almost to that point, and it should be quite simple from here on out. I'm looking forward to the lace bits at the bottom. Fit is still a challenge for me with sweaters. But I'm going to work on that. 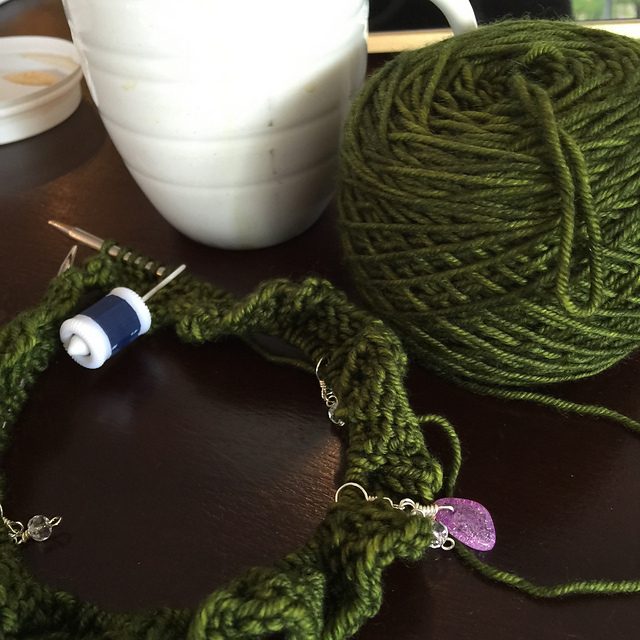 In September I'm going to a knitting retreat and taking "Knit to Flatter" with Amy Herzog. In the meantime, I'll give Vodka Lemonade my best effort, because I love the pattern, the yarn, and the color.